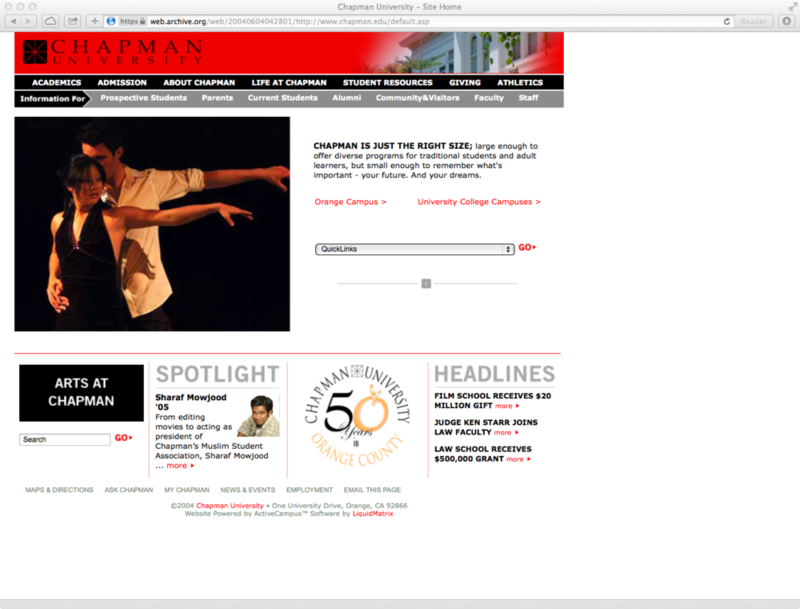 The Chapman University website redesign was a massive overhaul from a static site, which was awfully close to proving the xkcd joke about university websites true. The existing site didn't do a great job of providing information prospective students wanted: what was the school like? how should they apply? when should they apply by? It didn't meet the needs of their parents, either, who wanted to know: how much would it cost? will my kid be safe there? At the time, most universities relied heavily on print publications to deliver this information, and websites were usually just a side project of someone in the CompSci department who found themselves with some spare time on their hands. My role on the project was to focus on the user experience, trying to customize the site to each user. The university's mission statement was all about personalized education, and I thought the website should mirror that. So the website became very dynamic; components were swapped out and displayed depending on the student's choice of major, interests, and enrollment status: e.g., a high school junior who wanted to become a business major would see ads about the business club's meetings, lectures hosted by the School of Business, and notifications tailored to their particular deadlines for financial aid, applications, etc. Alumni wouldn't see undergrad information; instead they'd see information about Homecoming, alumni chapter meetings, and (of course) ways to donate. I also contributed to the overall design, UI, graphics, photos, etc. Sadly, the site's now defunct, so these screenshots are taken from the Wayback Machine. 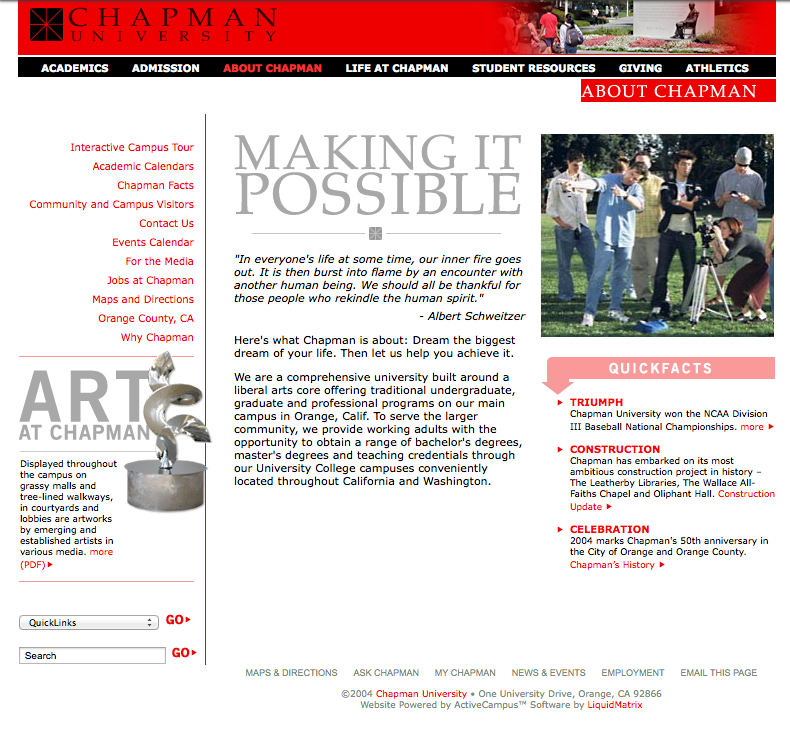 The website won a Bronze Admissions Marketing Report award in 2004 for its innovative design. Transitioning the site from static pages to a dynamic site and integrating it with the admissions student tracking software (Active Campus™), was a great deal of hard work, and wouldn't have been possible without the support of and code-heavy lifting of the Liquid Matrix™ content management system and team, who partnered with us. The committee did a huge amount of work to fully integrate the student tracking software into the backend of the website. I wish now I'd taken more screenshots when the site was live, but it seemed as if it'd never die — that design lasted for six years before it was revised in 2009.